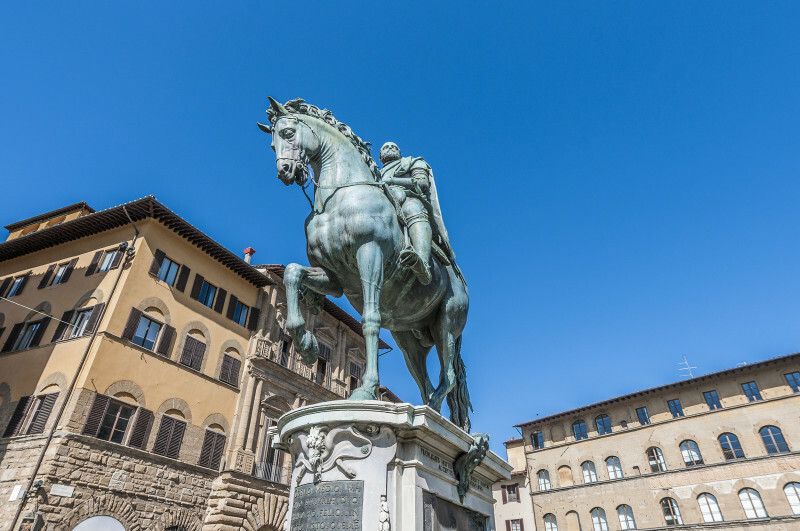 Medici family and history of Florence blended for nearly three centuries in many ways: the political and financial control played a role, but their cultural and spiritual influence spread beyond the boundaries of Florence and favored the cultural revolution that we call the Renaissance. Botticelli, Michelangelo, Vasari and many other artists were tied to a family that like no other supported the revolution in western culture that we still call the Renaissance. Follow their footsteps around Florence whether in museums or just walking on the streets. Origins and fortune of a dynasty: a visit of Palazzo Medici. The first Florentine residence of the Medici family and the only one that bears their name is the Medici Palace, commonly considered as the prototype of the Renaissance palazzo: through all changes the severe architecture of Michelozzo, the lavish decoration of the Chapel of the Magi, the roomy courtyard and the walled garden still tell us about the early fortunes and the rise of the family. Very close the Basilica of San Lorenzo offers a variety of examples of Medici patronage: Brunelleschi’s Old Sacristy, the sculptures by Donatello and the funeral monuments by Verrocchio. The complex, also including the Medicean Library and the Medici Chapels, is the result of three hundred years of work and commitment, involving Michelangelo and the greatest baroque artists in Florence. Medici get the power: Palazzo Vecchio and the Signoria Square. From the XVI century the Medici acquired the title of Dukes and moved to the Palazzo Vecchio, redecorated and adapted by Giorgio Vasari for Cosimo I: celebratory frescoes, the unique studying cabinet, the collections of maps and furniture reflect the great ambitions that accompanied their rise to power, amplified by the statues on the Signoria Square: the Neptune fountain, the equestrian monument of Cosimo I, the Hercules and Cellini’s Perseus remind us of the leading role played by the Medici in politics and art. Splendor and decadence: the Pitti Palace. The last Florentine residence of the family,Pitti Palace, was acquired in the XVI century and nowadays hosts various collections distributed in several museums inside the premises. Ambers, ivories, porcelains, jewelry, carriages, clothes, not to talk about the paintings and sculptures that keep alive the truest and yet mythical aura of the Medici: cynical politicians and avid collectors surrounded by artists scientists and intellectuals until their last representative, Anna Maria Luisa, ensured this treasury to the city of Florence “as ornament of the State, for Public utility and to attract the curiosity of Foreigners”. NOTE The 4 hour tour is meant to include Palazzo Medici interior and the church of San Lorenzo, while other monuments will be discussed from the outside. If you wish to change or extend the schedule we will be happy to adapt the itinerary to your needs.